Summary: Once again, Geraldine Brooks takes a remarkable shard of history and brings it to vivid life. In 1665, a young man from Martha's Vineyard became the first Native American to graduate from Harvard College. Upon this slender factual scaffold, Brooks has created a luminous tale of love and faith, magic and adventure. 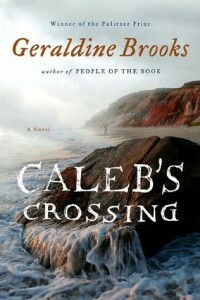 I just recently learned that Geraldine Brooks' has a new novel coming out called CALEB'S CROSSING. It will be released on May 3rd and I am positively ecstatic -- I might not be able to wait! I think this story sounds incredibly interesting; and that, combined with Ms. Brook's writing, means CALEB'S CROSSING have the chance to be a spectacular read! I consider Ms. Brook's to be one of my "special" authors namely because I have loved so many of her books including YEAR OF WONDER, MARCH and PEOPLE OF THE BOOK. Have I got your interest? Would you like to get your hands on a copy prior to May 3rd? Thanks to the fine folks at Viking, I have two galley copies of CALEB'S CROSSING to share with two lucky readers. To enter, just fill out the form below before Thursday, March 24th at 11:59 p.m. ET. I will randomly select and notify the winners the following day. This giveaway is open to those of you with U.S. and Canada mailing addresses only. Good luck! Brooks is one of those authors who can't write fast enough. But it's worth waiting for her books because they are so well written and crafted. Thanks for letting us know about this new one. I love, LOVE Geraldine Brooks. The People of the Book is one of my all time favorite books ever. I'm so excited to know she has a new book coming. I've never read this author but would love to! Sounds intriguing! Thanks for the giveaway. Sorry I got so excited at the prospect of getting my hands on an early copy of Caleb's Crossing that I posted my address (in Australia) before I read further and saw that it was for North American readers only. Just goes to show how much I love Geraldine Brooks, both her fiction and non-fiction. I am very excited at the prospect of this new novel and about a topic, first and early contact between colonists and natives, that intrigues me. Sorry that my reading wasn't more thorough but what a lovely giveaway anyway.